The NASA Kepler Mission won the highest honor for space programs at the 2012 Aviation Week Laureate Awards on March 7 in Washington, D.C. Students and professionals in the LASP Mission Operations Center control the Kepler spacecraft, which is surveying our region of the Milky Way galaxy for Earth-like planets. The Laureate Awards recognize individuals and teams for their extraordinary accomplishments in aviation and space sciences. The Kepler team won in the Space category based on the development, launch, flight operations and science data processing of its program. The Kepler Mission surveys the galaxy for Earth-sized planets with the potential to support life. As of today, the Kepler Science Team has confirmed 61 planets in the Milky Way habitable zone, where liquid water could exist on a planet’s surface. 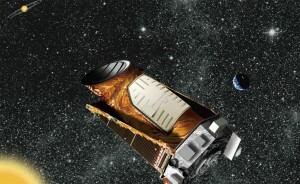 For more information about LASP’s role on the NASA Kepler Mission, please see http://lasp.colorado.edu/home/missions-projects/quick-facts-kepler/.